Ann Arbor (Informed Comment) – Saudi authorities tweeted Wednesday that they had executed 37 persons. The widely condemned step came while the kingdom was hosting a two-day economic forum that attracted some big names. This respectable attendance contrasts with the thin attendance last fall in the wake of the October 2 murder in the Saudi consulate in Istanbul of prominent Washington Post columnist Jamal Khashoggi. The oil giant Saudi Aramco made $118 billion last year, making it one of the best-earning companies in the world, and many people with capital are more interested in growing their capital than in protesting human rights abuses. Wednesday’s mass executions will be unlikely to slow this new gold rush to Riyadh. Khashoggi was prominent and famous, and if he could be carved up with a bone saw with impunity, the relatives of the 37 just executed stand little chance of getting a hearing. The Saudi government announced that the victims were “terrorists.” Some 33 of them appear to have been Shiite dissidents. Most of these Shiites were from Qatif and al-Hasa in the east of the country, but some were also from Medina in the West. It is unusual for Shiites in the West to be arrested. Human rights organizations expressed reservations about the judicial procedures used by the Saudis and suggested that confessions were the result of torture. There have been Shiite terrorist cells in eastern Saudi Arabia in the past, but Riyadh would have to be substantially more transparent about the evidence against the condemned before most global human rights organizations could be convinced that this was actually a matter of counter-terrorism. Mujtaba al-Sweikat was 17 in 2012 and was on his way to study at Western Michigan University in Kalamazoo when he was arrested at King Fahd International Airport for calling attending a pro-democracy rally in the aftermath of the 2011 Arab Spring. Mujtaba was executed yesterday. The judicial murder was condemned by Amnesty International, Human Rights Watch and UN Human Rights Commission head Michele Bachelet, on the grounds that people arrested as minors should not be subject to capital punishment. (Amnesty International is against capital punishment as a matter of principal.) The Saudi authorities charged him with organizing terrorist cells, which would have been quite a feat at 16 when he must have been plotting his dangerous activities. It is estimated that some 12 to 15 percent of the Saudi population consists of Shiites. The more extreme Saudis view them as wretched heretics and deny them the right to practice in public, and they face discrimination in the job market. Wahhabis are on a spectrum, with some of the Saudis to the far right; neighboring Qatari Wahhabis put freedom of religion into the Qatari constitution and are much more tolerant and open-minded. The Wahhabis are in control of Saudi Arabia, but may only comprise 40% of the total population. A lot of Saudis in the West are Sunni Muslims. Although nowadays it is common to speak of Wahhabis as a branch of Sunnism, historically it rejected key tenets of Sunnism, which is uncomfortable with excommunicating Muslims and permits individuals more personal liberty. Sunnis in Egypt permit Coptic churches and freedom of worship whereas no churches are allowed in Saudi Arabia. Most Shiites live in the Eastern Province, which is where the petroleum comes from. This human geography makes any dissent among them especially worrisome to the Saudis. The US has unnerved the world oil market by ramping up the pressure in its long-running dispute with Iran. It has announced that, after May 1, it won’t renew the exemptions given to eight countries that enable them to buy Iranian oil. Those affected, which include China, India, Japan, Italy and South Korea, will face sanctions from Washington if they don’t comply. The move will likely squeeze global oil supply at a time when it is already struggling from disruptions in Venezuela, Libya and Nigeria. Indeed, the Brent crude price has already risen on the back of the announcement to US$74 (£57) per barrel, the highest since last November. President Donald Trump has said he is confident that a supply crunch can be avoided thanks to extra output from Saudi Arabia and the United Arab Emirates, but traders and Asian petrochemical firms are sceptical that these countries will fully comply. In recent months, Saudi Arabia and other OPEC members have cut supply dramatically to redress their fears that hefty US shale oil output and declining global energy demand could cause a supply glut that would batter prices. In December the oil cartel, along with Russia and other allies, agreed to reduce output by 1.2m barrels per day (bpd), cutting the global total volume by more than 1%. They have since exceeded those benchmarks, with Saudi Arabia alone reducing supply by 800,000 bpd in total. In March the kingdom slashed production to a four-year low of 9.82m bpd, making up the majority of OPEC’s reduction of 295,000 daily barrels for the month to 30.3m bpd. Trump has already been calling on OPEC to raise production, with little success. The Saudis may be close allies of the Americans, but they will only act in concert with their OPEC counterparts and many around the table will be wary of risking reducing prices at an unpredictable time for the global economy. No one ever forgets when the Saudis famously went against Western interests in the Arab Oil Embargo of 1973, in response to US policies with similarly global consequences: president Richard Nixon had scrapped the gold standard, heavily devaluing the US dollar, and then backed the Israelis in the Yom Kippur war against Egypt. Inflation-adjusted oil prices nearly doubled during the embargo from around US$26 per barrel in 1973 to over US$46 per barrel the following year, sending economic shockwaves around the world. America’s latest move against Iran is making things worse for the global economy at a time when it has already been under pressure from rising interest rates and trade wars. If Iran’s entire output were removed – a big if since it is far from certain that all countries will comply with the Americans – it would wipe another 1m bpd or so off the world supply. Any resulting rise in oil prices would spread to other commodity prices, leading to inflationary pressure – particularly in countries affected by the end of waiver such as India, where inflation has already started picking up. Such countries would also see direct effects on their import bill and hence their balance of trade. For every dollar increase in oil rates in India, for instance, the import bill will rise by R110 billion (£1.2 billion) at a time when the country’s trade deficit already stands at over £8 billion. In many cases, such economic effects are all too capable of being exported. Take South Korea, which is the second biggest oil importer from Iran after China. South Korea mainly imports condensate, an ultra-light form of crude oil used for petrochemical products like naptha which it exports to neighbouring countries. If these petrochemical exports fall because Korean prices are no longer competitive, its neighbours will have to look further afield, creating a trade imbalance in the region. In the run-up to Trump’s campaign to be re-elected for a second presidential term next year – assuming he makes it that far – there is therefore a great deal riding on this US gambit. If OPEC does not step up to the plate, and the oil price continues surging upwards, it could yet become the moment when the longstanding fears around the health of the world economy finally crystallise into a full-blown downturn. The Israeli state and its supporters frequently accuse its critics of being motivated by anti-Semitism, and although they usually concede that it is not inherently anti-Semitic to criticise Israel, recent controversies have proven that it is quite difficult to ascertain precisely where genuine criticism ends and racism begins. One popular method for working this out is the so-called “3D test” — the “Three Ds of anti-Semitism” — developed by Israel’s one-time Minister of Internal Affairs, Natan Sharansky. This framework evaluates criticism of Israel against three “Ds”, namely demonisation, when “Israel’s actions are blown out of all sensible proportion”; double standards, when Israel is “singled out” or criticism is “applied selectively”; and delegitimisation, when “Israel’s fundamental right to exist is denied”. If a critical statement meets any of these criteria, then it is determined to be anti-Semitic. This test has been promoted by the likes of the US Anti-Defamation League as a simple way to distinguish “anti-Israel” criticism from anti-Semitism, but it falls short in at least one important way: its standards can easily be applied to the discourse surrounding countries other than Israel. In fact, the “3 Ds” mirror complaints made by supporters of apartheid South Africa in the 1970s and 80s, who also believed that their favoured country was subject to unfair criticism. A brief overview of pro-South African propaganda reveals comparable accusations of demonisation, double standards, and delegitimisation. Far from providing a reliable tool for analysis, Sharansky’s “3D test” merely codifies the same rhetoric that was used to defend apartheid South Africa, turning the language of pariah states into supposed evidence of anti-Semitism. South Africa’s supporters frequently complained that the country was being depicted from an entirely negative and one-sided point of view; they blamed the “biased” and “liberal media” for repeating uncritically disinformation from “terrorists” and Soviet Union “puppets” like the ANC, and for convincing the public that apartheid was uniquely evil. Indeed, they argued that biased media coverage had triggered emotional responses at the expense of rational analysis, poisoning the possibility of constructive debate. John Shingler, a professor at McGill University who was also a director of an elite pro-South Africa group, wrote that campus debates around South African divestment were “unbalanced”, “one-dimensional” and “wholly negative”. The result was that South Africa itself had become tainted as a country (and not just its policies), which had two main effects: the tone of the debate had become “abusive” and “shrill”, and it had become impossible to take a “moderate” position or to oppose sanctions without being accused of being “racists” and “fascists”. By demonising South Africa, it was claimed, any association with the country had become toxic. Many others questioned why “liberal do-gooders” did not boycott the Soviet Union or other African states. An anti-sanctions advertisement published in November 1985 by both the Globe and Mail and the Ottawa Citizen lambasted Prime Minister Brian Mulroney’s “one-sided ‘get-South Africa’ threats” and “hypocritical” sanctions, and asked why Canada was not boycotting “the Marxist dictatorship of Tanzania”. “There is a war going on,” stated journalist Peter Worthington grimly in his 1987 anti-ANC documentary, “not against apartheid, but against South Africa itself”. South Africa never had an argument that was exactly equivalent to Israel’s “right to exist”; that is, its supporters did not claim that white South Africans had a positive right to maintain ethnocratic control over the state, per se. Nonetheless, they argued that the demands of the anti-apartheid movement would lead to the violent overthrow or destruction of South Africa itself, and as such posed an existential threat. In this, the pro-South African lobby mobilised an implicit idea of white self-determination as threatened by African and Marxist barbarism. Supporters of South Africa rejected the call for “one person, one vote” by pointing to neighbouring African countries to show that democracy has not worked elsewhere on the continent but was in fact a “cataclysmic failure”. Toronto Sun columnist McKenzie Porter blamed this on “the inability of native blacks to govern well a modern state” and predicted that if apartheid was dismantled, “within a decade the only civilised nation on the African continent would collapse.” Babb warned of a “bloodbath” and in a full-page article for the Globe and Mail titled “The good side of white South Africa”, Kenneth Walker wrote that one person, one vote “is a recipe for slaughter in South Africa”. This is only a small sample of the arguments advanced by supporters of apartheid South Africa, who insisted that criticism of the country was unfair in a manner consistent with allegations of demonisation, double standards and delegitimisation. This suggests that Sharansky’s “3D test” for distinguishing criticism of Israel from anti-Semitism is fatally flawed because, in effect, it bundles together a number of rhetorical strategies that are not unique to Israel but have been used by other pariah states to justify their own oppressive practices. These strategies are, in essence, claims about a lack of fairness, and they are likely to be advanced by any country facing significant criticism. Using these tired and repackaged arguments as a weapon against Israel’s critics will not contribute to the fight against anti-Semitism, but rather undermine human rights activism. Comedian Hasan Minhaj recently slammed US President Donald Trump’s son-in-law and special adviser Jared Kushner to his face for support for Saudi Arabia’s de facto ruler, Anadolu reports. Addressing a New York City gathering celebrating the release of the annual Time magazine list of the 100 most influential people, Minhaj referenced the Kingdom’s detention of Loujain al-Hathloul, a Saudi activist who has been imprisoned, and who, like Minhaj, is a Time 100 honoree. “I know there’s a lot of very powerful people here, and it would be crazy if there was a high ranking official in the White House that could WhatsApp MBS and say, ‘Hey maybe you could help that person get out of prison because they don’t deserve it,” Minhaj said with Kushner present at the gala. He was referring to Mohammad bin Salman, who is oftentimes referred to simply by his initials. “But hey, that person would have to be in the room. It’s just a good comedy premise,” Minhaj added. The Indian-American comic had already run afoul of bin Salman for an episode of his Patriot Act comedy series which lambasted the crown prince for the murder of Washington Post columnist Jamal Khashoggi, and which was banned from streaming on Netflix in the Kingdom. Minhaj told Time after the gala he was sincere in seeking the presidential aide’s assistance in freeing al-Hathloul. In Time’s write-up of al-Hathloul, the magazine said the “Saudi people owe a huge debt of gratitude to” her for her activism. “She was among the first to challenge laws that are out of touch with Saudi Arabia’s young majority population, boldly posting videos of herself driving, running for the country’s first municipal elections to allow women in 2015, and signing the 14,000-strong petition urging an end to restrictions on women’s rights to marry or travel outside the country without a male guardian’s permission,” wrote Sarah Leah Whitson, Human Rights Watch’s regional director. “Unfortunately activism also revealed the crown prince’s intolerance for civil society,” she added. Ann Arbor (Informed Comment) – Iran is responding in kind to Trump’s harassment, with the Iranian parliament having voted to declare that the US troops of the Central Command or CENTCOM (which is responsible for the Middle East) are terrorists. The move came in retaliation for Trump’s designation of the Iranian Revolutionary Guards Corps (IRGC), Iran’s national guard, as a terrorist organization. Both designations are frankly silly. Terrorists are non-state actors. An army or a formal national guard, is not a terrorist group. It is an army. If it is doing something wrong, it is committing a war crime. The whole structure of the Geneva Conventions after WW II was intended to make these distinctions and to uphold the rights of prisoners of war. Members of a regular army taken prisoner may not be treated as terrorists or common criminals by their captors, with the benefit that this consideration applies to both sides in a conflict. This rhetoric is silly as an idea, but deadly dangerous if put into practice. The US has some 5,000 troops in Iraq, who are being hosted by an Iraqi government and army close to Iran and who are amid Shiite militias backed by the Iranian Revolutionary Guards. Will the latter now view them as terrorists and fair game? Likewise, some Iranian officials have threatened to close the Straits of Hormuz, through which some 22% of the world’s petroleum flows, if Iran itself cannot export its petroleum. Iran cannot likely do so, but the rhetoric is dangerous. The Iran War Party in Washington, D.C., tied to arms industries, to Big Oil, to the MEK guerrilla group, and to the Israeli far right, wants heated rhetoric and reckless action by Iran, because it provides them a pretext for military intervention against that country. National Security Adviser John Bolton asked the Pentagon for a plan for an operation inside Iran last fall, to avenge the alleged endangerment of US troops in Iraq by an Iran-backed militia. Then secretary of defense James Mattis appears only to have found out about the request later on, and that Bolton and the warmongers were behaving in this dangerous way and undercutting his authority likely led to his resignation. Bolton’s press to have the US military and the Revolutionary Guards treat each other as terrorists is another such ploy to provoke violence. I don’t think it would be too much to suggest that Bolton for his own selfish warmongering purposes is deliberately putting US troops in danger in this way. We already know he is basically a terrorist, given his strong ties to the Peoples’ Jihadis (MEK), which has at times been listed by the US as a terrorist organization. As David Aaron Miller and Richard Sokolsky argue at Politico, the Pompeo-Bolton-Netanyahu press to defund Iran and box it in is not a Trump-style hard negotiating tactic. It is intended to make sure there are no negotiations. It is intended to make sure that if the Democrats get back into the White House in 2020, they will not be able to simply reinstate the 2015 Iran Deal and try again to bring Iran back in from the cold. The Iran War Party wants nothing less than regime change in Tehran. If the US sent war ships into the Gulf and stopped Iranian ships from exporting petroleum, that would be a blockade and an act of war. The War Party has instead attempted to impose a financial blockade on Iran, using the threat of third party sanctions to scare Tehran’s trading partners off from doing business with it. The Trump administration will not likely have complete success in this strong arm tactic. I explained yesterday that China seems set to buck Washington. Iraqi prime minister Adel Abdul Mahdi pledged this morning to Iran’s leadership that Iraq would not cooperate with Washington’s blockade. It might be added that Iraq cannot afford to do so. Iraq is still economically hurting from the US invasion and occupation and then the rise of ISIL, and desperately needs Iranian help– electricity, fuel, investment. Iran’s best interests lie in keeping a cool head, keeping the 2015 Joint Comprehensive Plan of Collective Action (JCPOA) in place with Europe, Russia and China, and declining to give Bolton and Pompeo their pretext for intervention. I think President Hassan Rouhani, a center-right politician who pressed for the JCPOA, knows this. But his authority has been deeply wounded by Trump’s violation of the treaty, which vindicated the hard liners. Cooler heads may not prevail, especially given the scale of Washington’s financial blockade of Iran and the devastation the US is wreaking on the Iranian economy. One argument for the House to forge ahead with the impeachment of Trump is that at least it might keep the administration too busy to provoke an Armageddon in the Middle East. More than 300 people have now been confirmed killed in the Easter attacks in Sri Lanka. Several sources had suggested a domestic Muslim Islamist group may have been linked to the atrocity – but Islamic State (IS) has now also claimed responsibility. Muslim political leaders have continued to promote this “Moorish” identity, focusing on a collective Arab “blood connection” and pointing out that the island’s Muslims are not bound to any specific language (even though most of them speak Tamil). This is different to Muslims in Tamil Nadu, India, who see themselves as Tamils who adhere to the Islamic faith. In 1956, the so-called Sinhala Only Act made Sinhalese the country’s official language and was considered discriminatory by Tamil-speaking groups, who started to form militant groups. Tensions boiled over in 1983, when Tamil attacks on the Sri Lankan army triggered Sinhalese mobs to attack Tamils during a period known as “Black July”. As many as 3,000 Tamil civilians were killed, triggering a civil war that was fought between the Sri Lankan government and a number of Tamil groups, most notably the Liberation Tigers of Tamil Eelam (LTTE), and lasted until 2009. Early in the conflict, some Tamil-speaking Muslims sided with the Tamil struggle. But that soon changed as Muslims also became a target for Tamil separatists. In one such attack in 1990, around 150 people were killed by the LTTE when it raided two mosques in the town of Kattankudy. Bullet holes from the Kattankudy Mosque massacre. In the midst of the Tamil Tigers’ rebellion, da’wa (missionary) Islamic movements came to Sri Lanka. With this, “new” ideas of political Islam and different rules for clothing were brought to the country. This also triggered clashes between different Muslim groups. In one 2006 incident, for example, Islamic fundamentalists attacked a Sufi Mosque, highlighting two developments: the Muslim community was divided in Sri Lanka and Islamic fundamentalism was emerging. Another conflict has has also come into focus recently. Buddhist extremists and Sinhala nationalists have also clashed with Muslims on several occasions in recent years, leading to the death of several Muslims. Indeed, given that Muslims in Sri Lanka have been targeted both by Tamils and Sinhalese, why would a radical Muslim group specifically target another minority group like the Christians? Most likely, this militant group (if it is indeed behind the attacks) is inspired by the global jihadi discourse that sees the West and Western institutions, including the Christian church, as the overarching global enemy. What the outcome for the country will be after these attacks we cannot know. But a new chapter of violence appears to have begun in Sri Lanka and old divisions may yet again escalate further. The first paragraph of this article has been updated to include new developments. (Tomdispatch.com) – I never intended to run a marathon, but when I realized that I would be on hand for the 2019 Palestine Marathon, I registered. I did so in solidarity with the goals of the aptly named Right to Movement, the global running community founded in 2013 to organize the first annual marathon there. The irony was not lost on me, however: in training for a marathon meant to highlight the right to freedom of movement, I would utilize my privilege as a foreigner to access land that Palestinians themselves could not enter. I trained in the West Bank, dotted with Israeli settlements, checkpoints, and military bases; in the Gaza Strip, the Mediterranean coastal enclave under Israeli blockade since 2007; in the northern Israeli city of Haifa; and in Jerusalem, the western part of which has been part of Israel since 1948 and the eastern part of which Israel occupied in 1967. While I realized that there would be challenges during my training runs, what I hadn’t anticipated was the window they would provide into the lives of Palestinians living under Israeli occupation. I stretch my hamstrings just after dawn on the Dawabsheh family’s restored porch in the village of Duma, facing the scorched remains of their neighbors’ home. I met Eman, Ma’amoun, and their five sons in July 2015 after an Israeli settler had firebombed their home, as well as that of those neighbors (and distant cousins) Sa’ad and Riham Dawabsheh. Eman’s family had not been at home at the time. Sa’ad, Riham, and their children were not so lucky. Four-year-old Ahmad was rescued from the blaze and, despite severe burns, survived. Although Riham and Sa’ad were also pulled from the inferno, they succumbed to their injuries. Eighteen-month-old Ali’s tiny charred corpse was found in the ruins of the house after the flames were extinguished. I begin a slow warm-up jog through the village, imagining baby Ali’s first steps on wobbly toddler legs. I run past Ma’amoun’s goat sheds and cross through olive groves until I reach the main road and head south. I see signs for Shiloh and Shvut Rahel — Israeli settlements deep in the West Bank — and pass armed hitchhiking youths wearing knitted skullcaps. Narrow, sun-bleached side roads wend around terraced rocky hills and into neighboring villages. On one such road, Israeli army vehicles drive past as teenage soldiers stare at me from the back of an open jeep, assault weapons in their laps. Soon, I reach the entrance to an Israeli military base and promptly turn around before anyone questions me. The air grows warm, but I have more mileage to pound out, so I start up a rocky path and soon find myself on the outskirts of another village. Pulling out my phone to see where I am, I’m startled and check again. I hadn’t realized that Mughayyir was this close to Duma. I had been in Mughayyir only a week earlier with the Israeli human rights organization B’Tselem. Residents of the village had walked us through a recent attack by Israeli settlers from the nearby outpost of Adei Ad. The farmers were working their land here — one man indicated the slope behind him as thick fog rolled in. The armed settlers came from that outpost — he pointed to a nearby hill — and began attacking the villagers. A Palestinian flag fluttered under an overcast sky, marking the spot where 38-year-old Hamdi Na’asan had been shot and killed. I jog back toward Duma thinking of the photo I had seen of Na’asan holding his four children. It’s not until I pass more armed youth wearing yarmulkes that the realization hits me. The settlers who killed Hamdi Na’asan came from the outpost of Adei Ad. The settler who burned Ali Dawabsheh to death had also lived in Adei Ad. A goat herder waves to me from a terraced hill as I near the entrance to Duma. It’s Ma’amoun Dawabsheh. I head toward Gaza City’s seaport. The sun hasn’t crested. The air is crisp and cool. I run south alongside the waves, relieved that their rhythmic pulse drowns out the Israeli drones overhead. Their incessant buzzing always puts me on edge. One dawn in 2004, armed drones killed two militants outside the building where I was staying. Children scooped up scraps of the men’s scalps on small sticks, presenting them for me to film. I jog past youths maneuvering gracefully on paddleboards and young men pushing old wooden skiffs out to sea. An elderly woman is collecting something from the sand, whether shells or bait I can’t tell. Four miles into the run, I spot a pipe embedded in the side of a high sandy bluff discharging a stream of water too wide for me to cross. I scan the cliff, eager to reach the coastal road above it and notice a dilapidated cement staircase. I can’t imagine where it leads, but it goes up. I jog up the stairs and find myself in the ruined remnants of a building, most likely shelled by Israeli gunships during the 2014 war. I run through those ruins to a surrounding wall and locked gate, climb the wall, leap to the sidewalk, and continue jogging. Only then do I wonder: Did anyone see me? A foreign woman appearing out of nowhere, dropping from a wall surrounding a destroyed building, and running away is anything but inconspicuous. I half expect armed men to pull up on a motorcycle and begin questioning me, but the road, to my relief, remains deserted. I return to the beach and jog on it until I reach Wadi Gaza, a wetland rich in biological diversity that was declared a nature reserve in 2000. When I first visited this valley in 2012, however, the fresh water that once flowed into the sea here had already been replaced by human waste from nearby refugee camps. I returned in 2015 to find that a small sewage treatment plant had been built but was not yet operational. For 18 months, Israel had delayed the arrival of the aerators that mix oxygen into the waste water. They were finally allowed into blockaded Gaza later that year. The plant then operated until 2017 when, thanks to the Strip’s ongoing electricity shortages, it stopped. The river of untreated sewage I now confront is only a small part of the nearly four million cubic feet of excrement that are estimated to spew daily into the sea from the Strip. I run to the coastal road bridge, jogging past the plant’s large pool now brimming with waste. I can’t help but retch. I soon leave the stench behind me, aware that Wadi Gaza’s residents deal with that odor — and the resulting health risks and mosquitoes — every day. There are no sidewalks now. Curious boys on donkey-carts stare at me. At the halfway point of my training run, I return to the beach and turn around. Teenage boys drinking tea at a small campfire pause their animated conversation to cheer me on. I run north on the narrow sidewalk through Beach refugee camp in the emerging sunlight. The guards near Hamas leader Ismail Haniyeh’s house pay me no mind, but small children peer at me from the doorways of ramshackle cinderblock dwellings, their corrugated zinc roofs secured with chunks of concrete. Eighty-six thousand refugees live in Beach camp’s one-third of a square mile, making it one of the most densely populated places in the world. 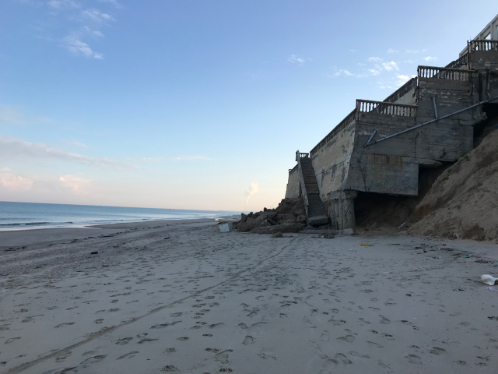 The steep cliff bordering the sea is strewn with car parts, broken appliances, jagged concrete blocks, and twisted rebar. A man and a teenager push a small skiff into the water to try their luck at a morning catch. Their luck is likely to be slim. After all, the Israeli navy permits fishing only up to six nautical miles off the coast, a restriction that limits the catch — and deepens Beach camp’s already endemic poverty. In 2015, I accompanied Majd, who is from Beach camp, on a nighttime fishing trip. Snagging sardines in his net under the stars, he told me about fishermen he knew who had been shot at sea. The danger continues: in 2018, the Israeli navy killed one fisherman, injured six others, and arrested 53. Past the camp, I connect with a dirt road and push forward until I can see what looks like a boundary fence in the distance. Israeli soldiers often shoot Palestinians they deem to have come too close to the barrier, which Israel constructed between 1994 and 1996 in order to control the movement of people and goods in and out of the Gaza Strip. Just the previous week, I saw someone shot by Israeli soldiers at a demonstration at another section of the barrier. I believe it was 14-year-old Yousef al-Dayah, who died from his wound, but I can’t be sure. Not wanting to risk getting too close, I turn around and head back towards Gaza City. The fishermen’s shacks ahead look idyllic but as I approach, one dog, then many, begin to bark furiously. I retreat, but they chase me. Given the chronic shortages of medicine in Gaza, if a dog bites me, I wonder whether rabies shots would even be available. I halt and the snarling dogs surround me. “Go away,” I command sternly and, to my amazement, they do. I walk cautiously toward the main road and, as the dogs resume their sun-drenched poses, begin jogging again. Hebrew and Arabic mingle freely around me on Haifa’s beachside promenade, which seems to lack the tension I’m accustomed to in other mixed cities in Israel. I pass the beach house that Rachel Corrie’s family rented during the civil court case they brought against the Israeli government. Rachel, an American human rights activist, had been trying to protect a Palestinian family’s home in Rafah, Gaza, from demolition on March 16, 2003. An Israeli military bulldozer ran over Rachel, crushing her to death. I helped the Corrie family with logistics during the trial in 2010, working in that very beach house where Rachel’s parents and four international eyewitnesses stayed. The surf had been calming as a grieving family went up against the Israeli state. The Corrie family lost the case. I follow dirt pathways through the sparse Jerusalem Forest and then, stunned, I halt. A cattle car is suspended on train tracks high above me. I’ve unintentionally run onto the grounds of Yad Vashem, the Holocaust museum. I feel shame to be so casually jogging on a site memorializing one of humanity’s most egregious atrocities, as well as horror thinking of those who were herded into that cattle car and so many others like it. I flash back to my first Yad Vashem visit in 1997. Our guide explained that the cattle car faced the sweeping hills of Jerusalem in order to intentionally stir Zionist sentiment and suggest that Israel — and its eternal capital Jerusalem — was the hope springing from the Holocaust. The shame and horror I feel is laced with anger that the cattle car in front of me and the tragedy it represents has been exploited to justify settler colonialism in the region. I find myself at Herod’s Gate outside the Old City of Jerusalem exactly at the 20-mile mark. I need to hydrate, shower, and rest, but the entrances to the Old City are blocked by Israeli police. I join a few youths watching from the sidelines as tensions mount between Palestinians being barred entry and the police. An Israeli settler approaches Herod’s Gate. The police permit him to pass. Someone had evidently thrown a firebomb at an Israeli police station on Haram al-Sharif/Temple Mount, one of the holiest sites of both Islam and Judaism and long a flashpoint in the Palestinian-Israeli conflict. This latest flare-up happened in the wake of the Islamic Waqf, the religious trust managing Muslim holy sites in and around Al Aqsa Mosque, opening Bab al-Rahma — the only Old City gate that leads directly to Haram al-Sharif/Temple Mount. Rightwing Israeli extremist groups pounced on this act, using it as political fodder to promote their messianic, nationalist dream of re-building a Jewish Temple here and so exacerbating Palestinian fears that Israel intends to partition the holy site. Herod’s Gate opens half an hour later. I walk to my friends’ home, passing a mother speaking Hebrew to her toddler. I realize that I’ve been hearing more Hebrew than I’ve ever heard in the Muslim Quarter of the Old City, a sign of creeping Jewish settlement in occupied East Jerusalem. It’s eerily quiet walking to Manger Square to pick up my marathon kit. The shop-fronts are all shuttered. Yesterday, Israeli soldiers killed 26-year-old Ahmad Manasra as he stopped his car in al-Khader (just outside Bethlehem) to help an injured man who had also been shot by a soldier. Bethlehem is observing a general strike to mourn Manasra. I study the map provided in the kit: tomorrow we will run right through al-Khader, not far from where he was killed. At 5:30 a.m., I arrive at the Church of Nativity, stretch, and buy a Dixie cup of Arabic coffee. Manger Square glows in the early morning light as it slowly fills with runners. Those of us attempting the full 26.2 miles make our way to the starting line and the race begins. 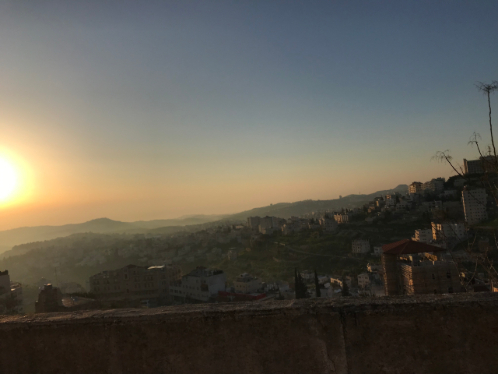 A brief descent from the church is followed by a long, even stretch with an open view of the sun rising over the neighboring town of Beit Sahour. We pass into Aida refugee camp, under a statue of a giant key, symbolizing the Palestinian right of return to the homes from which they were expelled during the establishment of the state of Israel in 1948. We enter al-Khader, but can’t go further without encountering an Israeli checkpoint. Half-marathoners will turn, run back to the Church, and stop. Those of us doing the full marathon will simply repeat the course, demonstrating something less than the right to movement. At the cone marking the turn-around point, I whisper a silent, secular prayer for Ahmad Manasra, killed near here two days ago, and head back to the church. I complete the 26.2 miles in four hours and 57 minutes. Much has occurred since that marathon only a month ago: a flare-up between Israel and Hamas in the Gaza Strip, Israeli elections leading to a future governing coalition led once again by Benjamin Netanyahu that is likely to propagate yet more intolerance and racism. But amid all of that, one particular incident haunts me. On March 27th, the Israeli army killed Sajed Muzher, an 17-year-old paramedic, in Dheisheh refugee camp. In a photo of the incident, army vehicles drive down the camp’s main road, stones thrown by Palestinian youth littering the street behind them. Five days earlier, I had willed my legs to propel me down that very same road. It’s the contrast that still jars me all these weeks later back in Brooklyn. The Bethlehem marathon — meant to highlight a people’s right to movement — was effectively bookended by the killings of Ahmad Manasra in al-Khader and Sajed Muzher in Dheisheh. Staring at the photo of Muzher’s youthful face and thinking of Manasra, Hamdi Na’asan, and Ali Dawabsheh, of the acute suffering of the besieged people of Gaza, it’s so clear to me: the right to freedom of movement should be inalienable and inextricably linked to the right to be safe in one’s own home, the right to farm one’s own land, the right to fish in the sea. The right to live. To thrive. Jen Marlowe, a TomDispatch regular, is a U.S.-based journalist, an award-winning author, documentary filmmaker, playwright, the communications associate for Just Vision, and co-producer of their film Naila and the Uprising. She is the founder of Donkeysaddle Projects. Follow her on Instagram and Twitter. (Ma’an) – As the 300-foot spire of the Notre Dame Cathedral in Paris tragically came tumbling down on live television, my thoughts ventured to Nuseirat Refugee Camp, my childhood home in the Gaza Strip.Then, also on television, I watched as a small bulldozer hopelessly clawed through the rubble of my neighborhood mosque. I grew up around that mosque. I spent many hours there with my grandfather, Mohammed, a refugee from historic Palestine. Before grandpa became a refugee, he was a young Imam in a small mosque in his long-destroyed village of Beit Daras.Mohammed and many in his generation took solace in erecting their own mosque in the refugee camp as soon as they arrived to the Gaza Strip in late 1948. The new mosque was first made of hardened mud, but was eventually remade with bricks, and later concrete. He spent much of his time there, and when he died, his old, frail body was taken to the same mosque for a final prayer, before being buried in the adjacent Martyrs Graveyard. When I was still a child, he used to hold my hand as we walked together to the mosque during prayer times. When he aged, and could barely walk, I, in turn, held his hand.But Al-Masjid al-Kabir – the Great Mosque, later renamed Al-Qassam Mosque – was completely pulverized by Israeli missiles during the summer war on Gaza, starting July 8, 2014.Hundreds of Palestinian houses of worship were targeted by the Israeli military in previous wars, most notably in 2008-9 and 2012. According to Palestine Liberation Organization records, 63 mosques were completely destroyed and 150 damaged in that war alone, oftentimes with people seeking shelter inside. In the case of my mosque, two bodies were recovered after a long, agonizing search. They had no chance of being rescued. If they survived the deadly explosives, they were crushed by the massive slabs of concrete.In truth, concrete, cements, bricks and physical structures don’t carry much meaning on their own. We give them meaning. Our collective experiences, our pains, joys, hopes and faith make a house of worship what it is.Many generations of French Catholics have assigned the Notre Dame Cathedral with its layered meanings and symbolism since the 12th century.While the fire consumed the oak roof and much of the structure, French citizens and many around the world watched in awe. It is as if the memories, prayers and hopes of a nation that is rooted in time were suddenly revealed, rising, all at once, with the pillars of smoke and fire.But the very media that covered the news of the Notre Dame fire seemed oblivious to the obliteration of everything we hold sacred in Palestine as, day after day, Israeli war machinery continues to blow up, bulldoze and desecrate.It is as if our religions are not worthy of respect, despite the fact that Christianity was born in Palestine. It was there that Jesus roamed the hills and valleys of our historic homeland teaching people about peace, love and justice. Palestine is also central to Islam. Haram al-Sharif, where al-Aqsa Mosque and The Dome of the Rock are kept, is the third holiest site for Muslims everywhere. Yet Christian and Muslim holy sites are besieged, often raided and shut down per military diktats. Moreover, the Israeli army-protected messianic Jewish extremists want to demolish Al-Aqsa and the Israeli government has been digging underneath its foundation for many years.Although none of this is done in secret; international outrage remains muted. In fact, many find Israel’s actions justified. Some have bought into the ridiculous explanation offered by the Israeli military that bombing mosques is a necessary security measure. Others are motivated by dark religious prophecies of their own.Palestine, though, is only a microcosm of the whole region. Many of us are familiar with the horrific destruction carried out by fringe militant groups against world cultural heritage in Syria, Iraq and Afghanistan. Most memorable among these are the destruction of Palmyra in Syria, Buddhas of Bamyan in Afghanistan and the Great Mosque of al-Nuri in Mosul.Nothing however can possibly be compared to what the invading US army has done to Iraq. Not only did the invaders desecrate a sovereign country and brutalize her people, they also devastated her culture that goes back to the start of human civilization. Just the immediate aftermath of the invasion alone resulted in the looting of over 15,000 Iraqi antiquities, including the Lady of Warka, also known as the Mona Lisa of Mesopotamia, a Sumerian artifact whose history goes back to 3100 BC.I had the privilege of seeing many of these artifacts in a visit to the Iraq Museum only a few years before it was looted by US soldiers. At the time, Iraqi curators had all precious pieces hidden in a fortified basement in anticipation of a US bombing campaign. But nothing could prepare the museum for the savagery unleashed by the ground invasion. Since then, Iraqi culture has largely been reduced to items on the black market of the very western invaders that have torn that country apart. The valiant work of Iraqi cultural warriors and their colleagues around the world has managed to restore some of that stolen dignity, but it will take many years for the cradle of human civilization to redeem its vanquished honor.Every mosque, every church, every graveyard, every piece of art and every artifact is significant because it is laden with meaning, the meaning bestowed on them by those who have built or sought in them an escape, a moment of solace, hope, faith and peace.On August 2, 2014 the Israeli army bombed the historic Al-Omari Mosque in northern Gaza. The ancient mosque dates back to the 7th century and has since served as a symbol of resilience and faith for the people of Gaza.As Notre Dame burned, I thought of Al-Omari too. While the fire at the French cathedral was likely accidental, destroyed Palestinian houses of worship were intentionally targeted. The Israeli culprits are yet to be held accountable.I also thought of my grandfather, Mohammed, the kindly Imam with the handsome, small white beard. His mosque served as his only escape from a difficult existence, an exile that only ended with his own death. The views expressed in this article are the authors’ and do not necessarily reflect Ma’an News Agency’s or Informed Comment’s editorial policy. Extinction Rebellion burst onto everybody’s screens with disruptions and mass arrests across the UK and around the world, in protest against government inaction on climate change. Radical disruptions have been at the heart of Extinction Rebellion’s activism since it was founded in 2018 – from January’s disruption of London Fashion Week, to the infamous naked protest in Parliament – but the scale of the most recent actions has finally succeeded in forcing mainstream news cycles to start giving the politics of climate change the attention it deserves. One could argue that Extinction Rebellion’s week of action was fortunately timed – the extension of Article 50 to October has created something of a news vacuum while everyone takes a momentary breather from Brexit. Nevertheless, activists would rightly claim that climate change is the bigger looming catastrophe. In October 2018, the UN’s climate agency published grave projections of the enormity of the challenge ahead if we are to limit the most catastrophic consequences of climate change. For both Extinction Rebellion and the Fridays for Future school strike movement, the piecemeal response of nations at the UN’s annual climate change conference two months later made it clear that there is no more time to lose. The aim, then, is to force the issue. Through their blockades of iconic central London sites, Extinction Rebellion is keeping climate change at the forefront of the public and politicians’ lips, making the seemingly abstract problem facing all of us feel real. And rather than just warning of this climate emergency, it offers a vision of an alternative future, where a Citizens Assembly takes the lead in reducing UK emissions to net zero. Perhaps inevitably, Extinction Rebellion’s actions have been met with a familiar backlash from some political commentators – witness Adam Boulton’s sneering performance on Sky News, and David Blunkett’s indignant authoritarianism in the Daily Mail. But while activists say they regret the disruption caused to working people, they consider their actions a necessary evil in order to change the conversation. Older activists will surely point to the impact and legacy of 1999’s Battle of Seattle, when the Global Justice Movement successfully closed down the World Trade Organisation’s annual meeting. Not only was this extremely empowering for those involved, it crucially helped make resistance to a largely abstract neoliberal governance structure seem concrete and real. Much like the Occupy demonstrations seven years ago, Extinction Rebellion’s latest eye-catching protests have been friendly and open, laden with artistic performances, talks, and human connection. This good-natured spirit has so far meant that the movement has gained significant traction not only on the airwaves, but on the streets too. Extinction Rebellion’s efforts are aimed at building momentum, and they are based in political science – their website highlights a figure that it takes just 3.5% of a nation’s population engaged in sustained nonviolent resistance to topple a dictatorship. In the UK, that’s less than 2.5m people. Their clear demands and principles give the movement a clarity and focus that the Occupy movement may have lacked, and they are growing week by week – Extinction Rebellion says that 50,000 people have joined the movement since the protests started. However, contemporary mainstream news cycles are fast and fickle, and the movement will have to act quickly and carefully to maximise use of their new-found public platform. It’s extremely important that the movement’s purpose does not become overshadowed by its tactics. Extinction Rebellion have ransacked the playbook of direct action repertoires – blocking roads, using fake blood, recreating funeral marches, and surprise nakedness. While these have so far been successful in bringing the movement’s name and cause to the fore, using such tactics ad nauseum can quickly lose the public’s imagination and support. This was evident in the Global Justice Movement of the 2000s, as the desire to recreate the euphoria of Seattle resulted in tactical “summit hopping” with diminishing returns. State agencies also learn quickly how to police repeated mobilisations more ruthlessly and extremely – although Extinction Rebellion’s “trademark” repertoire, the tactical use of mass arrests, so far appears to be combating this threat effectively. Police have powers to disperse protesters, but the sheer number of people now willing to be arrested shifts the balance of power between the public and the state. For example, police have so far been unable to clear any of the four sites in central London, as spates of arrests were closely followed by new wave of protesters arriving to entrench control. The city’s police stations do not have the capacity to hold hundreds of arrested protesters for long periods of time, and court costs will discourage officers from pursuing charges, limiting the punitive power of the state. At the same time, Extinction Rebellion’s tactics risk fetishising the act of being arrested as a symbol of participants’ commitment to the cause. The movement’s co-founder, Roger Hallam, recently told the BBC that in order to achieve its goal of “getting in the room with government”, it may need to create a law and order crisis on the scale of 1,000 arrests. Such an arbitrary target is problematic, as it may encourage activists to take more risk in pursuit of a goal that is by no means guaranteed. Even if one is critical of the politics seemingly behind many “aggravated trespass: charges, a criminal record can be extremely costly and discriminating for many younger activists, especially people of colour. This contrasts with the relative risks posed to seasoned activists whose job, lifestyle, or privilege allows them to ride the consequences. It is crucial that Extinction Rebellion fulfils a duty of care to support those who are prepared to put their bodies on the line, but with more than 700 arrested already, its an expensive, high-risk game should multiple criminal charges be brought. But for now, Extinction Rebellion activists will consider recent events as a runaway success. They have gained visibility, traction, and have at least temporarily steered media attention away from Brexit. Most importantly, they have put climate change squarely in the middle of public conversation. Let’s hope it stays there.